Let me start by saying that I really enjoy Maya Banks' books. I was a little thrown by this one though, as it seemed to be missing things or just lacking in what I have come to expect from Ms. Banks. Drake is an alpha male who is used to getting what he wants. Not in some things, but in all things. He uses intimidation, money, and his loyal men to get the job done. While I had issues with his alpha-ness when it came to Evangeline, I think overall, he just lacked development or depth. He was sweet and generous when it came to Evangeline, but he believed that he needed to keep her wrapped in bubble wrap in order for her to "survive in his world." I liked his men far more than I liked him in this book. Evangeline is somewhat of a conundrum. She was humiliated and rather than stand up for herself, she somehow manages to catch Drake's eye and then submits to his every whim without really knowing him. While I can understand the power an alpha male who won't take no for an answer might have, she just seemed to fold on herself pretty quickly. She molded to what Drake needed. There were times in this story that I wanted to shake each character. They had the potential for so much. And while I did enjoy the story as a whole, there were things in their history that seemed to be glossed over. Also, I absolutely hated how Drake treated Evangeline throughout. Despite telling her she was important to him, he didn't quite live up to those words. I truly hope that Evangeline will find someone worthy of her gift or that Drake will quit being so alpha-holeish and show her what she is to him. 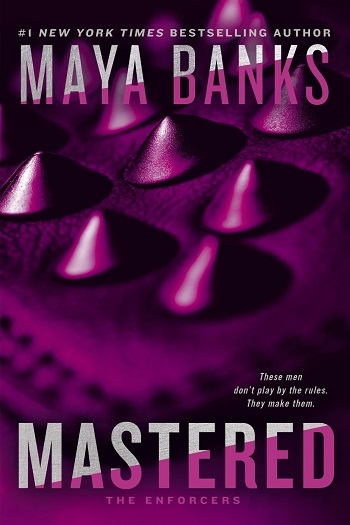 Avid Reader reviewed her personal copy of Mastered (The Enforcers #1) by Maya Banks for this post.